Welcome to the 'Long-term survival' section of our SOS (Safe Outdoors Survival) site - this is an extension of our Safesurvival and Preparedness site and will deal with the challenges and issues, both physical and pyschological, that may be encountered in the longer term of survival living. In recent times we have witnessed increasing severe weather anomalies, such as Hurricanes, earthquakes, flooding and droughts, and all the pointers look toward worsening climatic catastrophes at some point in the near future. As if this was not enough, we are bombarded each day by the media and governments that we are in the middle of some kind of fundamentalist so called ‘war of terror’. Whether you believe this scenario, or one that is more closer to home, the main point is, that at some point we not only have to be prepared for a short-term emergency incident but have to wake up the idea that we may have to resort to the longer-term survival issues. Thus, from the three or five day emergency preparedness plans one may have to extend this to months and even years. For example, the stored bottle water may progress to a more permanent solution of home made water filters, and the stored cans of fruit and vegetables will have to extend to the development of orchards and small-holding areas. 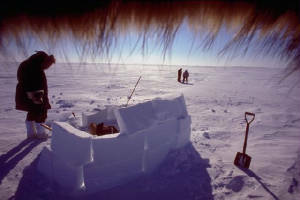 In addition, skills and techniques will have to be learnt in order to construct that temporary shelter into a more permanent homestead, employing natural ‘green’ materials, such as timber, straw and stone. This section of our safe survival-preparedness website deals with these very issues; and by following the developing online book Are You Prepared for a ‘Jericho-type event’ we will look at the challenges, both physical and psychological, of the longer-term survival living.